OVER 2,600 CYCLISTS were hospitalised in road accidents in 2015 and 2016, new figures have revealed. A parliamentary question asked by Independent TD Tommy Broughan showed that 1,350 cyclists attended hospital in 2015 due to being injured in a “transport accident” and 1,339 in 2016. There were 80 discharges from Our Lady’s Children’s Hospital Crumlin in both 2015 and 2016; 56 in 2015 from Temple Street Children’s Hospital and 72 in 2016. Cork University Hospital had the highest number with 146 discharges in 2015 and 127 in 2016. Broughan said he was very worried about the high number of people injured on a yearly basis. He said: “I have finally been receiving some data on injuries in road traffic collisions. I forwarded the PQ replies from the HSE to Minister Harris and Minister Ross this morning, urging them to examine the very high numbers of people being injured on our roads. Last month, a group of cyclists took part in a lunchtime protest against new Luas Cross City signs that urge people on bikes to dismount and walk. They also wanted to raise awareness of the impact of the new Luas Cross City layout on those who cycle around the city centre. 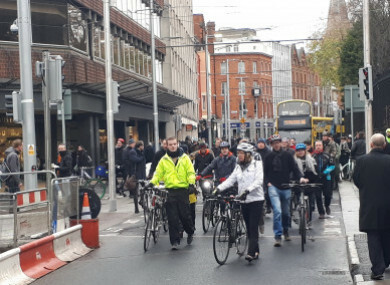 The event, organised by I Bike Dublin, saw over 35 participants dismounting near College Green, one of the busiest parts of the city centre, and walking up and along part of Nassau Street. This section of the road, along which buses, the Luas, and pedestrians can pass, is where cyclists are asked to dismount. A transport official told TheJournal.ie that these dismount signs are advisory signs and were erected for safety reasons. Email “Nearly four cyclists are hospitalised in Ireland every day ”. Feedback on “Nearly four cyclists are hospitalised in Ireland every day ”.